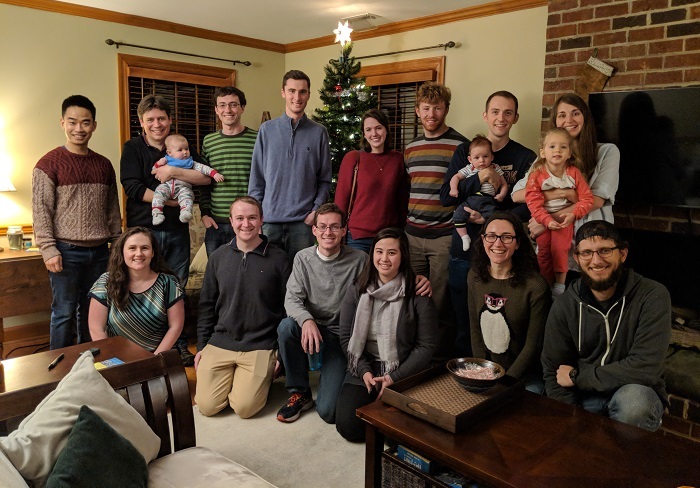 The 5th annual group holiday party was a grand success! Many excellent secret santa gifts were exchanged. Jim's collaborative project with Dr. Alex Tropsha in Pharmacy is named a Creavtivity Hub Finalist. Congrats! Sarah, Corban, and Jimmy participate in the Jingle Bell Jog. Corban takes 3rd place overall! Seokhyoung gives a talk and wins the Gold MRS Graduate Student Award at the Fall 2018 national MRS meeting. Congratulations! Aaron wins the UNC Convergence Fellowship. Congrats! Jake Evans receives the David L. Stern Scholarship in Chemistry. Congrats! Our collaborative paper with the Boland group at Trinity College Dublin -- Solvent-Engineered Stress in Nanoscale Materials -- is published in ACS Applied Materials and Interfaces! Jim gives two talks at the 2018 SERMACS meeting in August, GA. First-year graduate students Sarah, Corban, and Lorenzo join the group. Welcome! David's collaborative paper with the Lugstein group at Technische Universität Wien -- Tuning Electroluminescence from a Plasmonic Cavity-Coupled Silicon Light Source -- is published in Nano Letters! Jeremy wins the best theory poster at the 6th annual Triangle Student Research Competition! David's paper -- Interplay of Surface Recombination and Diode Geometry for the Performance of Axial p-i-n Nanowire Solar Cells -- is published in ACS Nano! Jim attends the 2018 Packard Reunion in San Diego. Kyoung-Ho departs to begin his faculty position in the Department of Physics at Chungbuk National University. Best of luck! Seokhyoung gives a talk at the SPIE Optics+Photonics conference in San Diego. Jim gives an invited talk at the first IEEE RAPID--Research and Applications of Photonics In Defense--Conference in Miramar Beach Florida. David departs after completing his PhD--best of luck in the next steps! First year chemistry graduate students arrive--welcome! The group has the fourth annual cookout and baby Lili's 1st birthday at Jim's house! Seokhyoung's paper -- Mie-Coupled Bound Guided States in Nanowire Geometric Superlattices -- is published in Nature Communications! See the UNC press release here. David successfully defends his PhD dissertation. Congrats! 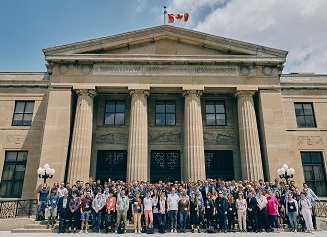 Jim, Jimmy, and Taylor T. give talks at Nanowire Week 2018 in Hamilton, Canada. Welcome to our summer undergraduate researchers Jake, Jeremy, and Cory! Shannon successfully defends her PhD dissertation. Congrats! Our Undergraduate Student Jake Evans receives the 2018 ACS Undergraduate Award in Physical Chemistry! 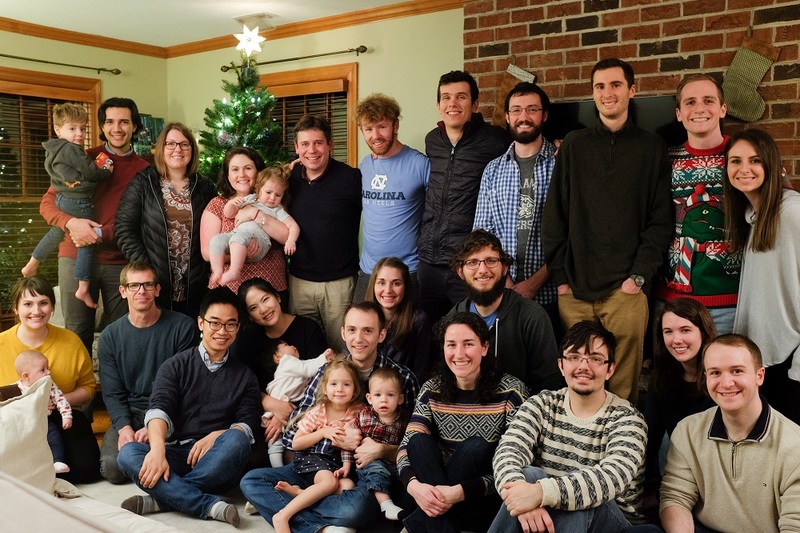 The group holds the fourth annual holiday party! Taylor M. begins her post-doc at NREL. Best of luck! Taylor M. and Tom both pass their final defenses--congrats! 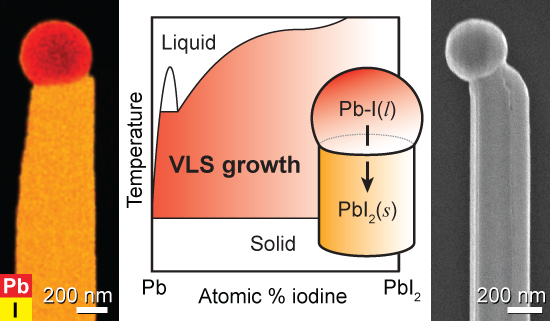 Jon's paper -- Self-Catalyzed Vapor-Liquid-Solid Growth of Lead Halide Nanowires and Conversion to Hybrid Perovskites -- is published in Nano Letters! Our collaborative paper -- Enhancement of Light Absorption in Silicon Nanowire Photovoltaic Devices with Dielectric and Metallic Grating Structures -- is published in Nano Letters! 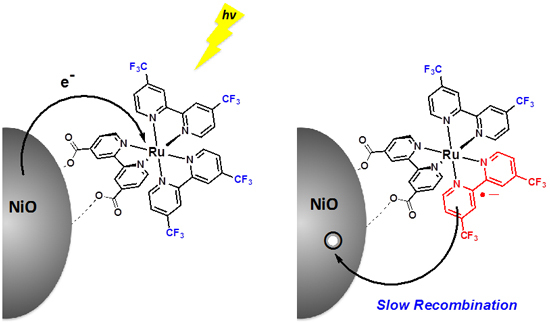 Our collaboration with the Dempsey group -- Interfacial Electron Transfer Yields in Dye-Sensitized NiO Photocathodes Correlated to Excited-State Dipole Orientation of Ruthenium Chromophores -- is published in Can. J. Chem.! 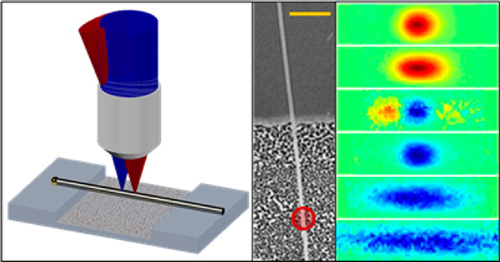 David's collaborative paper with the Atkin group -- Mapping Free Carriers in Multijunction Silicon Nanowires Using Infrared Near-Field Optical Microscopy -- is published in Nano Letters! 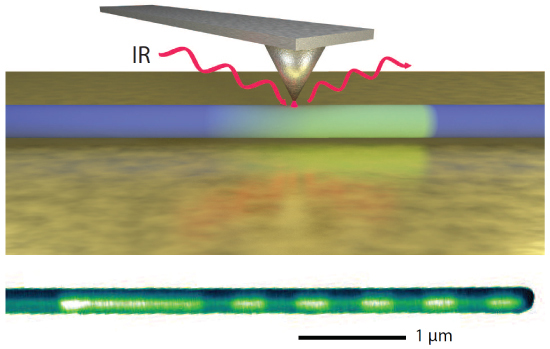 Jim's News and Views article -- Letting Photons out of the Gate -- appears in Nature Nanotechnology! Jim gives a talk at the 232nd ECS meeting. David and Taylor B. 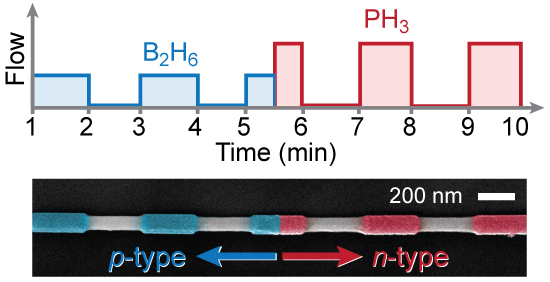 's paper -- Encoding Highly Non-Equilibrium Boron Concentrations and Abrupt Morphology in P-Type/N-Type Silicon Nanowire Superlattices -- is published in ACS Applied Materials and Interfaces! Taylor M.'s paper is one of the most cited Materials Discovery articles. 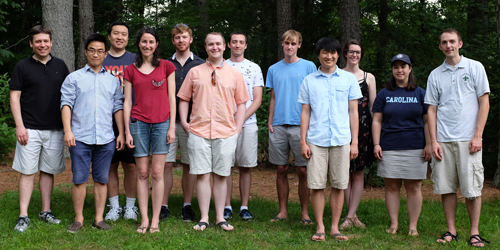 The group is awarded a grant through NC's Research Opportunity Initiative (ROI) that will establish the Center of Hybrid Materials Enabled Electronic Technology (CH-MEET)! Click here to read the press release. The RTNN Coursera course Nanotechnology: A Maker's Course goes live! Read the UNC press release here. 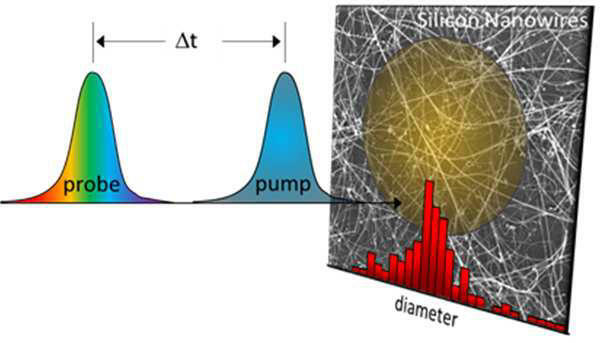 Our collaborative paper with the Papanikolas group -- Probing Intrawire, Interwire, and Diameter-Dependent Variations in Silicon Nanowire Surface Trap Density with Pump–Probe Microscopy -- is published in Nano Letters! Jim is awarded the Phillip and Ruth Hettleman Prize for Artistic and Scholarly Achievement by Young Faculty! Click here to read the University Gazette article or here to read the College article. 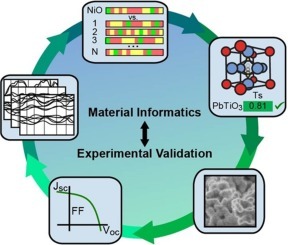 Our article with the Tropsha group using materials informatics to identify photocathode materials is discussed in the Science Daily article "Breakthrough tool predicts properties of theoretical materials." Jim is promoted to Associate Professor with tenure! Many thanks for all hard work from the group over the past six years! Group alumnus Dr. Joseph Christesen is awarded a Humboldt Fellowship for his post-doctoral work. Congrats, Joe! Chris successfully defends his final dissertation. Congrats, Chris! The group has the third annual cookout at Jim's house! David and Seokhyoung present posters at the Nanowire Week conference in Lund, Sweden. 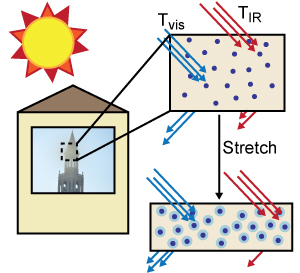 Taylor M.'s paper in collaboration with the Tropsha group -- Material Informatics Driven Design and Experimental Validation of Lead Titanate as an Aqueous Solar Photocathode -- is published in Materials Discovery! Seokhyoung's paper is highlighted in C&EN Chemistry in Pictures. Taylor M. is awarded a Department of Chemistry Hiskey Fellowship. Congratulations! Aaron, Taylor B., and James all pass their prelim exams. Congrats to all! Jim gives a talk at the IEEE-NEMS 2017 meeting in Los Angeles, CA. Jae and Morgan successfully defend their undergraduate honors theses. Congrats! Robert successfully defends his PhD thesis. Congratulations! Jon passes his prelim exam. Congrats Jon! 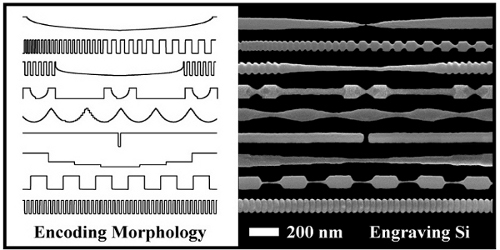 Seokhyoung's paper -- Designing Morphology in Epitaxial Silicon Nanowires: The Role of Gold, Surface Chemistry, and Phosphorus Doping -- is published in ACS Nano! Jim gives talks in the Department of Chemistry at the University of Colorado Boulder and the University of Chicago. Shannon and Taylor M. present posters at the GRC Nanomaterials for Applications in Energy Technology in Ventura, CA. 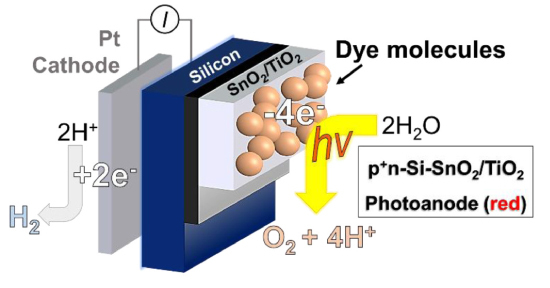 Our collaboration with the T. Meyer group -- All-in-one Derivatized Tandem p+n-Silicon-SnO2/TiO2 Water Splitting Photoelectrochemical Cell -- is published in Nano Letters! Jim gives a talk in the Department of Chemistry at North Carolina Central University. The first annual meeting of the National Nanotechnology Coordinated Infrastructure (NNCI), of which the Research Triangle Nanotechnology Network (RTNN) is a site, is held at Georgia Tech. Welcome Kyoung-Ho Kim, post-doc and visiting scientist from Hong-Gyu Park's group! Jim co-organizes Symposium NM1 -- Semiconducting Nanowires, Nanoribbons and Heterostructures: Synthesis, Characterizations and Functional Devices -- at the National MRS Meeting in Boston. Chris' paper -- Barrierless Switching between a Liquid and Superheated Solid Catalyst during Nanowire Growth -- is published in J. Phys. Chem. Lett.! Jim gives a talk in the Department of Chemistry at the University of Wisconsin Madison. Joe departs for Max Planck Institute for Quantum Optics. Best of luck, Joe! Jim gives talks in the Department of Chemistry at the University of Utah and at Northwestern University. 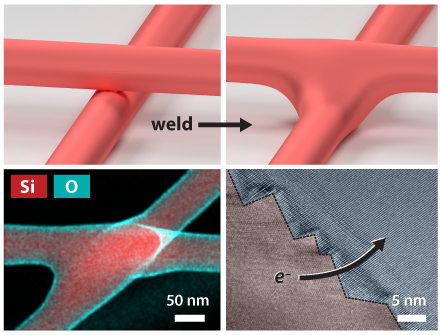 Tom and David's article -- Capillarity-Driven Welding of Semiconductor Nanowires for Crystalline and Electrically Ohmic Junctions -- is published in Nano Letters! Joe successfully defends his PhD thesis. Congratulations, Joe! The group has the second annual cookout at Jim's house! 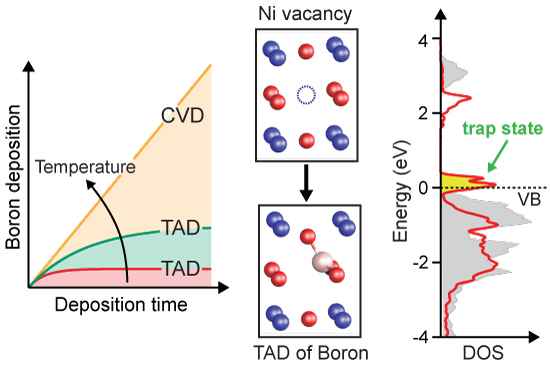 Cory's article -- Passivation of Nickel Vacancy Defects in Nickel Oxide Solar Cells by Targeted Atomic Deposition of Boron -- is published in J. Phys. Chem. C! Cory departs for Eastman Chemical. Best of luck, Cory! Jim gives a talk in the Department of Chemistry at Cornell University. Our Highlight article in the J. Mater. Chem. 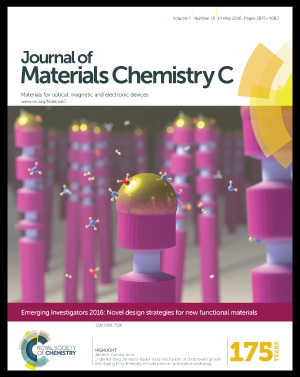 C issue "Emerging Investigators 2016: Novel design strategies for new functional materials" is featured on the cover! The group runs a booth at the annual UNC Science Expo! Jon is awarded an NSF graduate research fellowship. Congratulations, Jon! Cory successfully defends his PhD thesis. Congratulations, Cory! 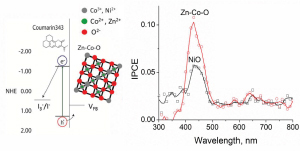 Shannon's paper -- Compositionally-tunable mechanochemical synthesis of ZnxCo3-xO4 nanoparticles for mesoporous p-type photocathodes -- was named a 🔥hot paper🔥 of 2015 for J Mat. Chem. A! Jim gives a talk in the Department of Chemistry at Johns Hopkins University. Seokhyoung passes his prelim exam. Congrats! Jim gives talks in the Departments of Chemistry at Georgia Institute of Technology, Emory University, Rice University, and the University of Texas at Austin. 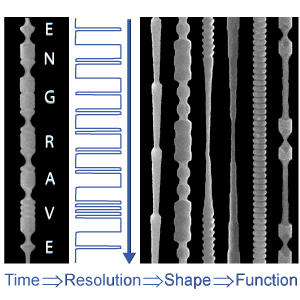 Our Perspective article -- Chemically Engraving Semiconductor Nanowires: Using Three-Dimensional Nanoscale Morphology to Encode Functionality from the Bottom Up -- is published in J. Phys. Chem. Lett.! 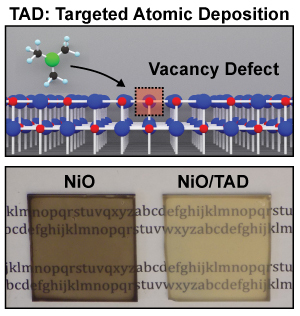 Cory's article -- Site-Selective Passivation of Defects in NiO Solar Photocathodes by Targeted Atomic Deposition -- is published in ACS Appl. Mater. Interfaces! Our Highlight article -- Understanding the Vapor-Liquid-Solid Mechanism of Si Nanowire Growth and Doping to Synthetically Encode Precise Nanoscale Morphology -- is published in J. Mater. Chem. C for the upcoming Emerging Investigators issue! The group is awarded an NSF CAREER grant. Thanks for the continuing support from the National Science Foundation! Jim gives a talk in the Department of Chemistry at the University of Illinois Urbana-Champaign. Taylor's paper -- Designing Plasmon-Enhanced Thermochromic Films Using a Vanadium Dioxide Nanoparticle Elastomeric Composite -- is published in Adv. Opt. Mater.! Jim gives an invited talk at the 9th International Conference on Advanced Materials and Devices, ICAMD2015, on Jeju island, South Korea. 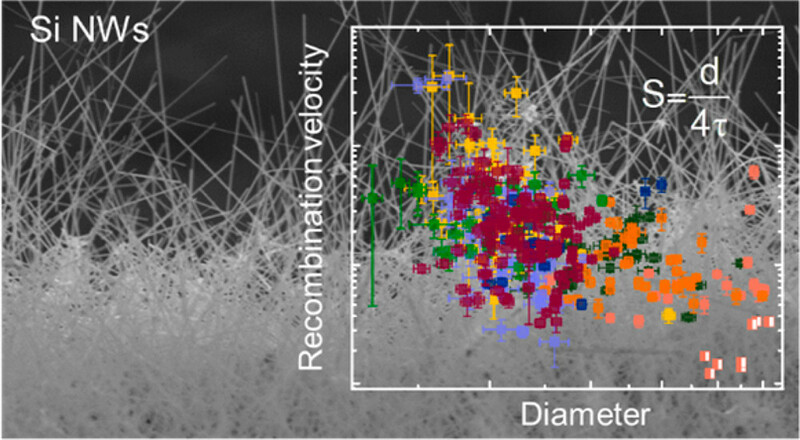 Our collaborative paper with the Papanikolas group -- Imaging Spatial Variations in the Dissipation and Transport of Thermal Energy within Individual Silicon Nanowires Using Ultrafast Microscopy -- is published in Nano Letters! A warm welcome to new group members Taylor B., Aaron, Jimmy, and Jon! Shannon's paper -- Compositionally-Tunable Mechanochemical Synthesis of ZnxCo3-xO4 Nanoparticles for Mesoporous p-Type Photocathodes -- is published in J. Mater. Chem. A! 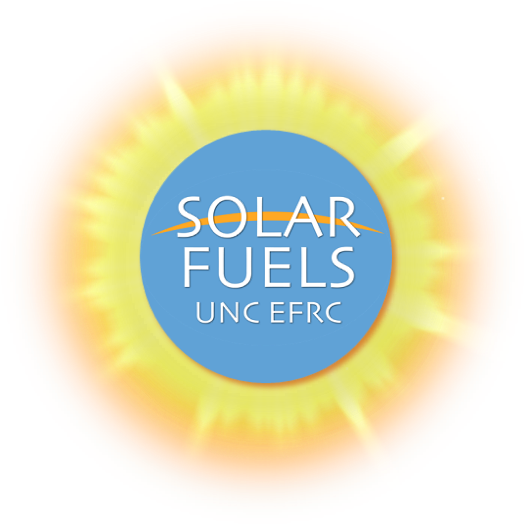 Jim co-organizes the 2015 Solar Energy Research Center (SERC) conference "Building the Dye-Sensitized Solar Fuel Device" in Chapel Hill, NC. Jim gives a talk on new advances in NiO solar photocathodes at the NC Photochem 2015 Symposium 2015 held in Charlotte, NC. The RTNN (Research Triangle Nanotechnology Network) is selected as a 5-year $5.5 million site in the NSF's National Nanotechnology Coordinated Infrastructure (NNCI) network. Joint between Duke, NCSU, and UNC, Jim is co-PI and UNC site director, working closely with Carrie Donley, director of CHANL. Click here to read the UNC press release. 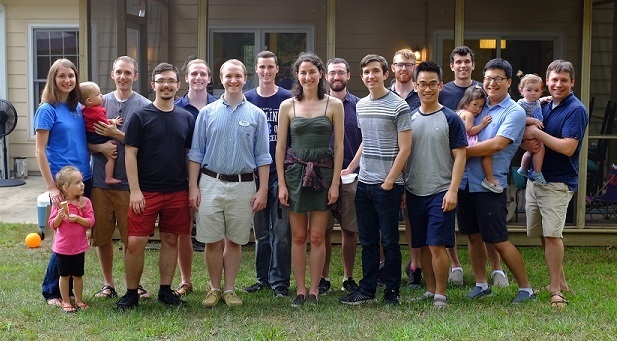 The group participates in the 3rd Annual Triangle Student Research Competition, organized by the UNC-CH, Duke, and NCSU Materials Research Society chapters and the Triangle Electrochemical Society. The group wins the prize for top participating research group! Jim gives a talk at the 27th Annual Packard Fellows Meeting in Monterey, CA. The group has the first annual cookout at Jim's house! Jim gives a talk at the Cottrell Scholars Conference in Tucson, AZ. 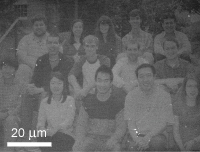 The group participates in the annual UNC Science Expo, demonstrating smart-phone based light microscopy of materials. As part of the event, CHANL makes a "nano-portrait" of the group. Thanks CHANL! Shannon passes her prelim exam. Congrats Shannon! Shannon and David H. are BOTH awarded NSF Graduate Research Fellowships! Congratulations! David H. passes his prelim exam. Congrats David! Robert and David H. give poster presentations at the GRC conference "Nanomaterials for Applications in Energy Technology" in Ventura, CA. Jim is awarded a 2015 Sloan Research Fellowship. Many thanks to the Alfred P. Sloan Foundation for this support! The fellowships "seek to stimulate fundamental research by early-career scientists and scholars of outstanding promise." Click here to read the Sloan Foundation announcement or click here to read the UNC press release. Robert and David's collaborative work on enhancing absorption in nanowire solar cells is published in Nano Letters -- Doubling Absorption in Nanowire Solar Cells with Dielectric Shell Optical Antennas. 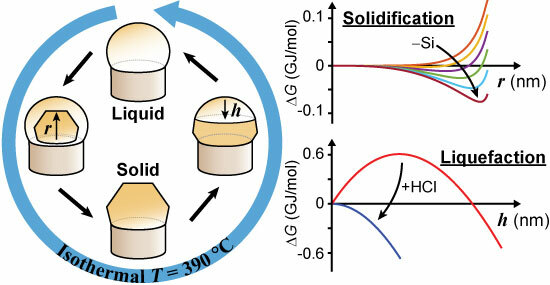 Joe's paper -- Encoding Abrupt and Uniform Dopant Profiles in Vapor-Liquid-Solid Nanowires by Suppressing the Reservoir Effect of the Liquid Catalyst -- is published in ACS Nano. We've added another group member. Welcome Seokhyoung! Jim is awarded a 2014 Packard Fellowship for Science and Engineering, which provides $875,000 in flexible funding over 5 years. Many thanks to the Foundation for this generous support! Click here to read the Packard Foundation announcement or click here to read the UNC press release. Our collaborative EFRC project to develop new p-type photoelectrode materials, led by Candy Mercado and Art Nozik at NREL, is published in J. Phys. Chem. C.